What Can Pokemon Go Teach Small Businesses About Marketing? Dublin at the moment, like most other cities, is currently full of people walking around looking at their phones (well even more than usual). They're playing Pokemon Go the new augmented reality smart phone game. When the game was first released in Ireland I noticed adults sheepishly walking around playing the game trying to hide what they were really doing. In recent days more and more people are playing and nobody is trying to hide it. Why? I think it was to do with a concept known as 'social proof'. This is the idea that when we see others, especially other people like us, exhibiting a particular behaviour then we are more emulate that behaviour ourselves. Unlike most games which can be played at home in order to play Pokemon Go the player has to go out in the world and walk around. The visibility of adults playing the game emboldens others to play the game without embarrassment. Due to there visibility every player becomes an advertisement for the game. If a small business or organisation can make an aspect of their project more visible they can leverage social proof to promote their product, idea or cause. Badges are an ideal way to do this. A well designed badge will be voluntarily work by your existing customer and seen by their friends. Your new potential customers will trust their friends much more than they will trust any paid advertising or other marketing message coming straight for you. The badges we made for the Mattress Men documentary about Mattress Mick are a great example of this. 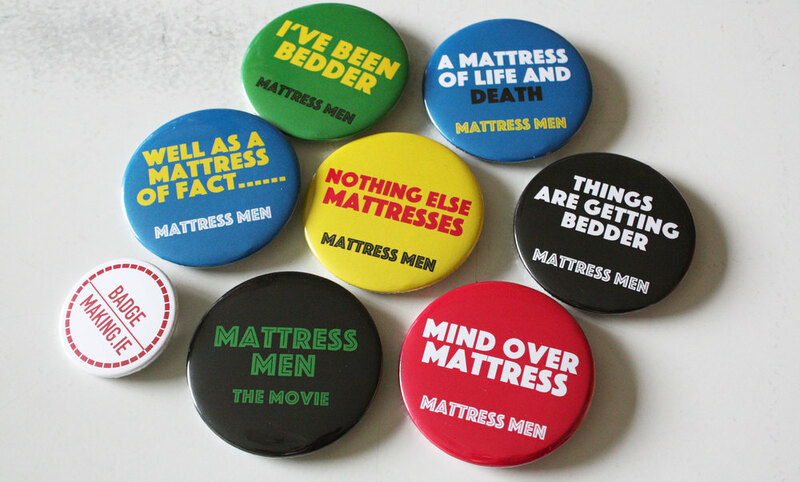 The badges focus on cheesy, ironic, mattress themed puns which are appropriate to the subject matter of the documentary and to the target audience. These badges offer the wearer something, in this case humour, rather than just prominently pushing the name of the documentary. People are happy to wear the badges because of the humour and the wearing of the badge is an endorsement of the film to their friends and colleagues. The same principle applies to any project or cause. Please use the contact form to place an order. BadgeMaking is a business registered with the CRO in Ireland.